This afternoon, Rosabel and Karl Kaufmann, George Angehr, Jan Axel Cubilla and Darién Montañez hit Costa del Este at high tide looking for the Kittiwake yet again, with no success on that front yet again. This afternoon's 16' tide pushed zillions of gulls to Costa del Este, and all we had to do was find the rare ones in the massive flock of mostly breeding-plumage Laughing Gulls. 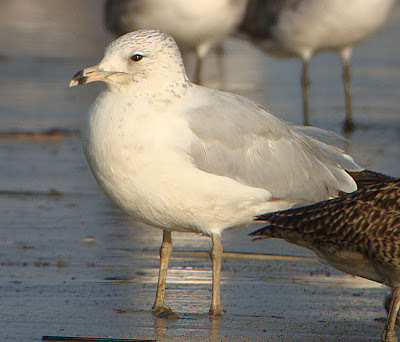 The third-cycle type Kelp Gull made a late appearance but stayed in sight for a long while, as did not one but three first-cycle Lesser Black-backed Gulls, one of which is shown here next to one of the at least three first and second-cycle Herring Gulls. Also seen were at least five first and second-cycle Ring-billed Gulls (one of which was as ratty as a Herring Gull). 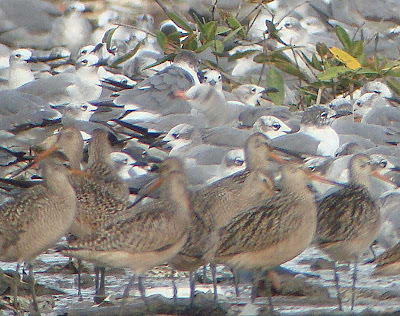 Also present were a bunch of cineracens Black Skimmers, a Franklin's Gull, and what proved to be a Laughing Gull with a Heermann's-like black-tipped red bill (the blurry bird inthe middle of all the Laughing Gulls behind the Marbled Godwits).